Please consider this letter as a formal request to utilize Calgary’s City Hall Atrium. Since your formal application is completely unconstitutional, demanding citizens to give up their rights in signing a law abiding contract with the city prohibiting them from exercising their freedoms such as, freedom of religion, freedom of expression, freedom of assembly, freedom of conscience etc., we have no choice but to submit this formal application for the use of the public space inside City Hall. We humbly ask for your acknowledgement and a blessing from your offices upon this wonderful initiative. Since there is no designated place provided for religious worship inside Calgary’s City Hall (and there are such designated places inside City Hall’s in different municipalities) we Christians from different churches have taken up this challenge in providing week after week on Tuesday at the noon hour, an amazing opportunity for our city and all it’s citizens, for the benefit of all, a church service (religious activity). Some citizens feel that the care takers of the municipal buildings in our city of Calgary are biased and prejudiced against the deep conviction of their faith and some even believe that, in fact, there is an open agenda of discrimination specifically directed against Christians. We would like to prove them wrong. We Calgarians want to follow a wonderful example such as Toronto (there is a chapel open during business hours and a three hour prayer/worship meeting inside their City Hall chambers) and other cities that embrace all of their citizens including those that profess their Christian faith openly. We take this time to express our desire of working together with a representative of City Hall’s various departments. We believe that there is always an opportunity to come to consensus if the parties that are involved are willing to be humble enough to sit down and put their differences behind them and come to a mutually beneficial agreement. We believe that there is always a good time to work together and to discuss a solution in a situation that clearly shows that the city of Calgary is falling behind in comparison to other municipalities. From the documents that we received from different provinces it shows that, as in British Columbia alone, there are about 30 different meetings conducted on a regular basis inside their City Hall chambers for the purpose of prayer, worship and religious activities. Some of those meetings are conducted during different hours, but we humbly suggest that having our meeting at noon would be the least ‘intrusive’ and the least ‘disruptive’ as some may suggest although, for the past few months we have observed and proved that our prayer and worship are absolutely not, in any shape or form, disruptive or hindering to any one that either works or conducts business at City Hall. Certainly our meetings are not more inconvenient than thousands of children or the countless number of boots that travel through Calgary’s City Hall Atrium through out the year, not to mention other countless events that take place inside by the approval and the blessing of the City Hall’s representatives. You see, your documents disallowing certain activities inside City Hall are unconstitutional and need to be changed. If you need help in this process we are definitely at your service. We have one desire, that our public servants such as yourselves would simply follow the law of the country and acknowledge the Charter’s protected rights. 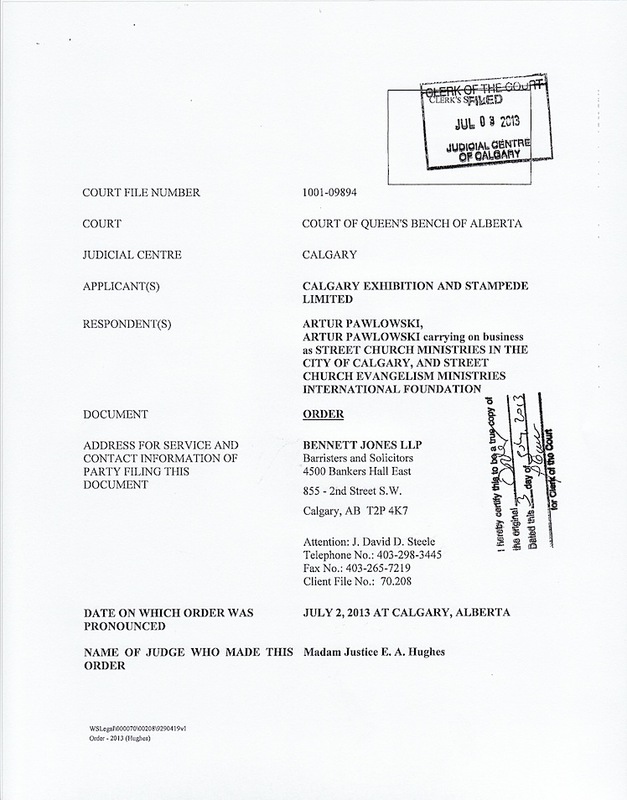 In conclusion, consider this letter as an official request, application for permit if you will, to provide Calgary’s citizens with a religious service at City Hall without receiving intimidation, fear of being arrested or being dragged before the courts. If for some reason our presence in the Atrium is inconvenient for some (even though we do have the right to be there and do what we do, and quite frankly we are comfortable in the Atrium and would like to stay there) we are willing to compromise and move the service inside the City Hall’s chambers which during the noon hour stays empty. Thank you for reading this request and we are looking with anticipation for your sirs and mums reply. Do not hesitate to contact me directly to discuss this matter at 403-607-4434 or via e-mail at art@streetchurch.ca. Yesterday the Courts have upheld our fundamental rights to protest. July 3, 2013 Artur Pawlowski Comments Off on Yesterday the Courts have upheld our fundamental rights to protest.